Ray used to bark at everybody (and pretty much every dog) who came remotely close to us, and it was quite disturbing. We assumed that he didn’t like them for whatever reason, but it was not until we enrolled him in a B.A.T. (Behavior Adjustment Training) program that all was revealed. The trainer set up the circumstances for the reaction and, within minutes, had an explanation and a solution. What she had seen, and we had not, was Ray giving a slight turn of his head towards us when he saw the person/dog. She suggested that he was now in an uncomfortable situation; was simply looking to us for some direction and, in the absence of any, he would take charge (which is exactly what he was doing)! The solution was to watch for that slight head turn, and then give him a treat! The timing was critical because treating late would simply reinforce his discomfort (and actions), and treating before the head turn would serve no purpose. Ray soon caught on to the idea that people and dogs often mean treats, which is no doubt why he has become so sociable! Ray’s book (“Who Said I was up for Adoption?”) covers so many of the training rationales that have been used for him, and is recommended reading for anybody who has a challenging dog, or who is contemplating adopting a dog. It is a one day/week x 4 weeks program and Ray is enrolled! We recently had our first session, and Ray did appear to remember the trainer, which was very nice… and she certainly remembered him (affectionately). Being the first Session, it was a combination of working with some basic concepts and, of course, giving the dogs some time to adjust to each other, but it will be interesting to see how Ray responds to this program… so stay tuned! A tired dog is a happy dog! Good luck with the rest of your classes! Hi Ashley and welcome! This blog about my beloved Ray (and various other topics!) has been going since October 2014 but, so you don’t have to read everything: He adopted me while he was at our local Humane Society having been picked up as a stray. He had a long list of issues, and I had never lived with a dog before, but he did adopt me so………! 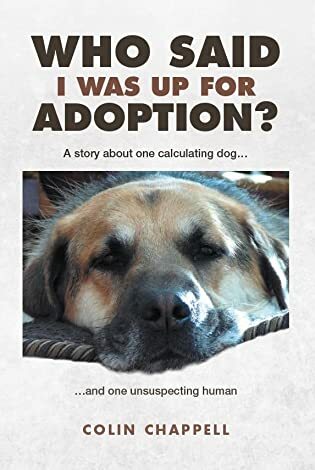 The first 18 months were an emotional roller coaster for me, all of which has been documented in a book “Who Said I was up for Adoption?” with the profits going back to his Humane Society! Here is a short cut to the “adoption process”! Calm and well behaved… the goal for all dogs and husbands. Thank you for sharing this. I found it useful and will continue to pay attention to subtle cues from Butter. I am happy for your success! Well you didn’t catch the head tilt initially. 😃 Seems subtle to me. Sounds like a great time for all this summer – especially for Ray! Hi Sarah. It should work out really when we are in our hot/humid weather, as Ray much prefers cooler temps! We should be able to wear him out playing “inside” games! I had a dog once that would bark at anything and thinking back, he did turn his head to me, repeatedly while doing this. Good information here. Looking forward to hearing more about his training. It should be interesting. He has already established himself as “Mr Cool” by laying on the floor with his front paws crossed! The two dog trainers we met at our Humane Society are both wonderful, and very giving of their expertise. This current trainer was referred to us by one of the Humane Society trainers re the B.A.T. program.